CDVI, a leading access control manufacturer worldwide, announced new readers with advanced technology solutions to showcase at the Security Event. Secure reader technologies are one of the first steps towards more secure access control systems. The new MIFARE® and DESFire® readers from CDVI offer added security in a stylish design. “MIFARE® and DESFire® cards and readers are far more secure than traditional readers thanks to the encrypted technology used. The new SOLSYSDW et SOLARMD are recommended for use with access control systems in higher security areas and buildings.” – Ian Oakley, UK Technical Support Manager. CDVI’s ATRIUM Online Access Control system offers many security features: from allowing or denying access, to managing users’ rights and accessing their location in the event of an emergency… It also allows for a more secure management and data processing, thanks to its edge-based features and online data storage. 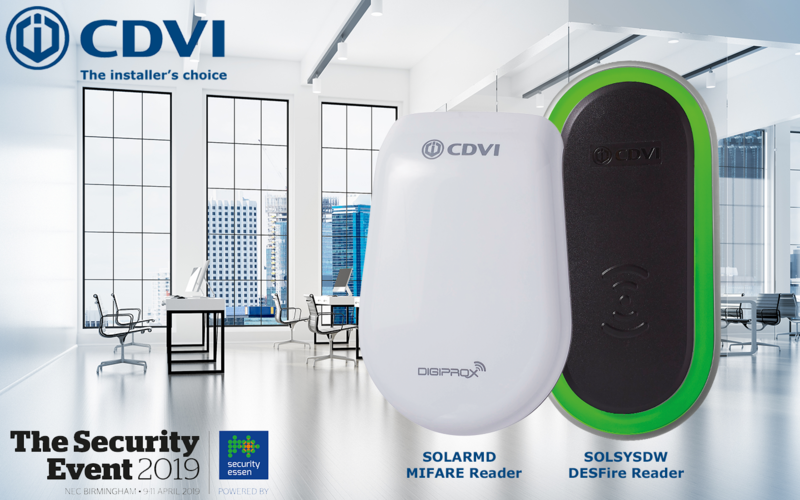 The SOLSYSDW DESFire® and the SOLARMD MIFARE® are two new stylish readers from CDVI with audible and visual feedback thanks to multicoloured LEDs. Their aesthetic appearance makes them ideal for more modern buildings and offices, while offering added security for storing credentials and data. The CDVI group is a worldwide manufacturer of leading-edge security solutions for every installer, offering products ranging from Biometric & Online Access Control, Electromagnetic Locking, Keypads, Standalone Entrance Systems to Door Automation. Without a doubt, you will find a product at CDVI for your latest project and with the free in-house training available at their facility in High Wycombe you will be able to get the most out of CDVI products.